Everything you need to know to store properly, prevent waste, and use what you have! 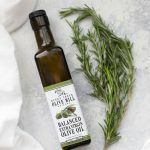 This post is written in partnership with Queen Creek Olive Mill, one of my FAVORITE sources for high quality olive oils, olives, preserves, and vinegars! All opinions are my own. I am a major fan of using fresh herbs. They felt like such a luxury when our budget was extra tight in college (when I started this blog! ), but I’ve found that they can be quite affordable these days. I can get cilantro for $.50-.99 per bunch (even organic! ), and most other fresh herbs for $1.99 or so for a large bunch. Our farmer’s markets often carry them for a fabulous price as well (I got 3 GIANT potted basil plants for $5 a few weeks ago! ), so I’ve started using them more and more in the past few years. Beyond their gorgeous color, they add so much fresh, bright flavor to my dishes. Whether it’s something deep and rich, like rosemary in my favorite beef stew, something light and fresh like my honey sweetened berry lemonade, or something savory and bright like my perfect pasta sauce, I just can’t get enough. That said, there are few things sadder to me in the kitchen than shelling out the money for fresh herbs and having to throw them away because they’re wilted or browned or mushy. Usually recipes call for a small amount of what you buy, so unless you plan ahead (i.e. “I’ll use cilantro for butter chicken on Sunday and fresh salsa on Tuesday”), it’s so easy to flush money down the drain (and waste all those delicious herbs!) if you don’t get to them. This is the best prevention in my experience for herbs like cilantro and parsley. When you store properly, these herbs can last up to 2 weeks! For other fresh herbs, like basil and mint, I’ve had good luck extending their life by placing them in a loose plastic bag with a damp paper towel. They won’t last as long as the cilantro and parsley, but I can often coax an extra few days out of them this way. Lastly, I mentioned this above, but doing a little bit of planning ahead for what you plan to make during the week can easily help you use up your herbs. If you’re buying basil for pasta sauce, try making a batch of pesto with the rest, or serving a lemon-basil salad dressing with your dinner later in the week. 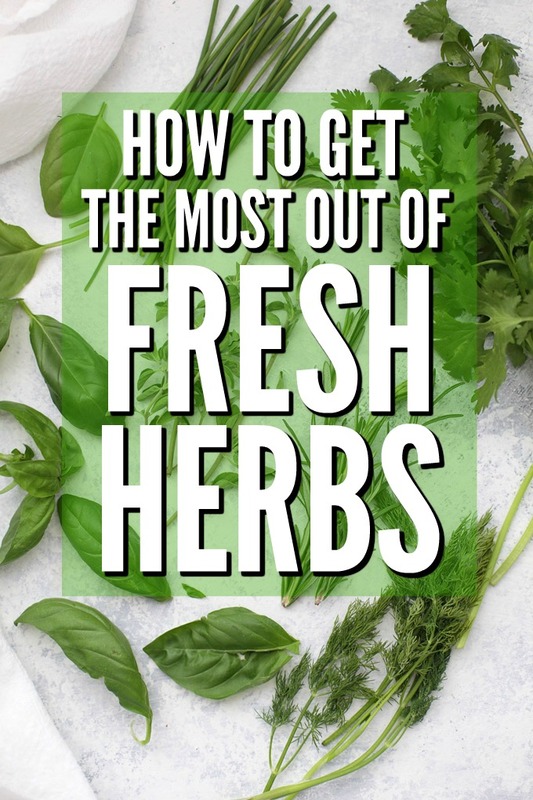 It’s pretty easy to toss fresh herbs in with your veggie side dishes (just about any steamed, baked, or roasted veggies pair well with some kind of herb), or sweet or white potatoes, if you plan for it. You can also experiment with salad dressings, flavored mayo for sandwiches or burgers, or boosting your favorite sauces and soups. You can check out some of my tips for meal planning here, but I usually peek into the fridge on Sunday and decide what I need. I make my grocery list after going through what I have, so if I notice I still have half of my rosemary left I might pick up some sweet potatoes to use it on, and then go from there . This is my favorite method for storing herbs and couldn’t be easier! They’re literally just little cubes of olive oil and herbs. They’re so simple and last so well. I freeze them out into 1 Tbsp amounts, so I can pull one out any time I’m cooking. Whether I’m making a marinade for chicken, roasting potatoes, dressing steamed or sautéed veggies, whisking up a salad dressing, or punching up some soup or pasta sauce, they work beautifully. To add an extra layer of flavor, I LOVE combing different oils and herbs. Since we’ve lived here, I’ve been buying Queen Creek Olive Mill Olive Oils at my local Sprouts (they carry locally made products in each store), but I recently got to go the actual olive mill to see things firsthand. They have a gorgeous array of infused oils (think Meyer Lemon, Roasted Garlic, Chile, Jalepeno, Mexican Lime, etc. ), and their more traditional line of oils is incredible. 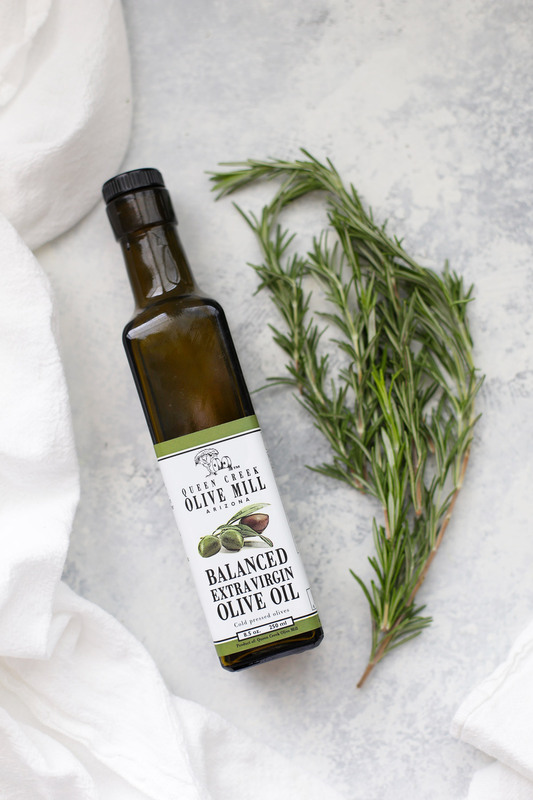 Their Balanced Olive Oil just won the gold at the New York International Olive Oil Competition for flavor, and has been my go-to for All The Things for ages. Check out the video below for some of my favorite herb and oil combinations. These are totally going to kick up your cooking! 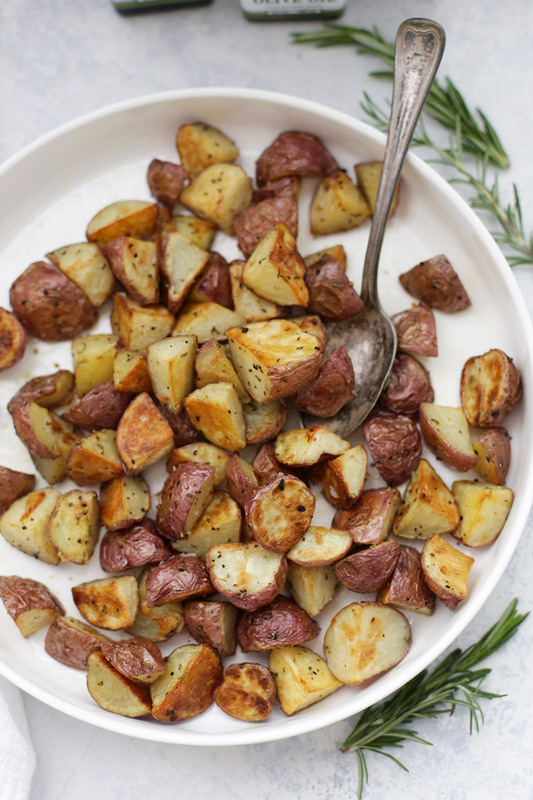 Rosemary + Balanced Olive Oil: amazing on roasted veggies or potatoes, or tossed into a slow cooker roast. Basil + Roasted Garlic Olive Oil: Adds such a nice savory layer to pasta sauce & pesto, as well as salad dressing! 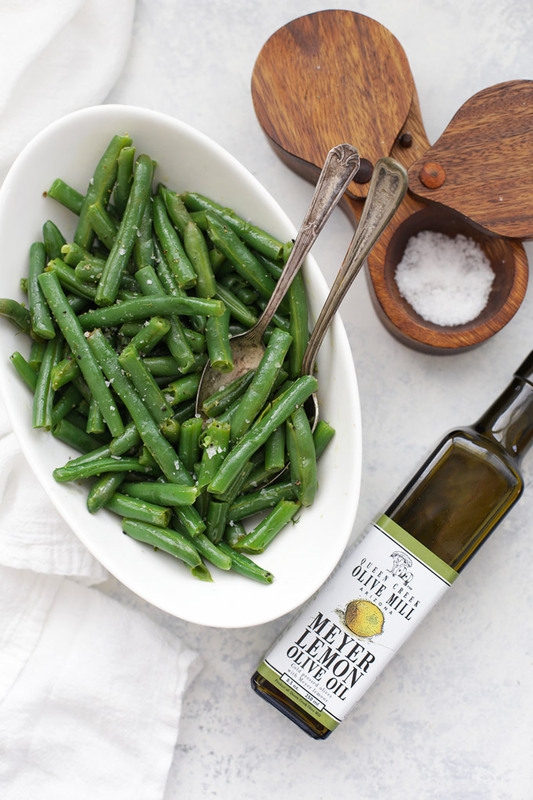 Dill + Meyer Lemon Olive Oil: This is phenomenal on green veggies, like broccoli and green beans, but also makes fabulous vinaigrettes! Queen Creek Olive Milll has a TON of delicious options. For Arizona locals, it’s a super fun place to visit, with an awesome restaurant (and menu! 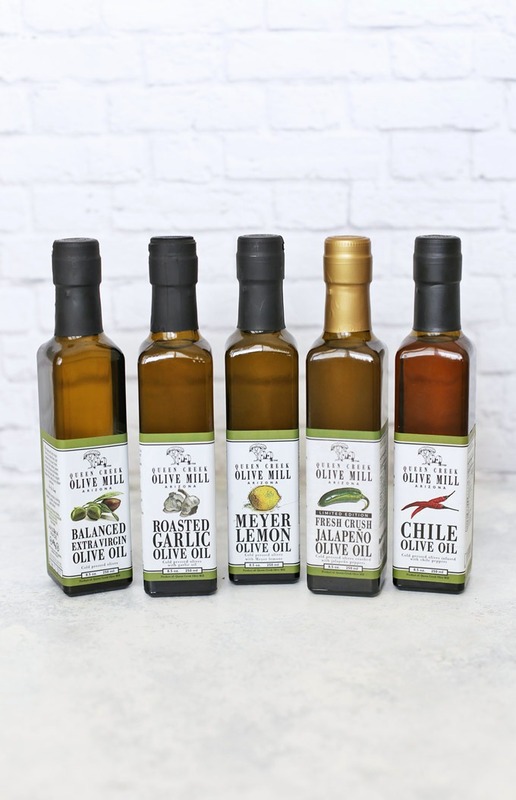 ), olive mill tours, and a fabulous shop with oils, vinegars, olives, preserves, a gelato bar, olive oil soaps, locally made treats, and more! They also ship nationwide, so you can order for yourself or someone you love. Don’t miss their Instagram for behind the scenes updates, specials and sales, recipes ideas, and more! P.S. I swear by this silicone ice cube tray. Everything comes out so easily! You can make as many or few of these herb + olive oil “bombs” as you like. If you’re using up a whole bunch of basil, or the last Tablespoon of your fresh rosemary, you can scale this as big or small as you like! Try mixing and matching flavored olive oils with different herbs for endless combinations! 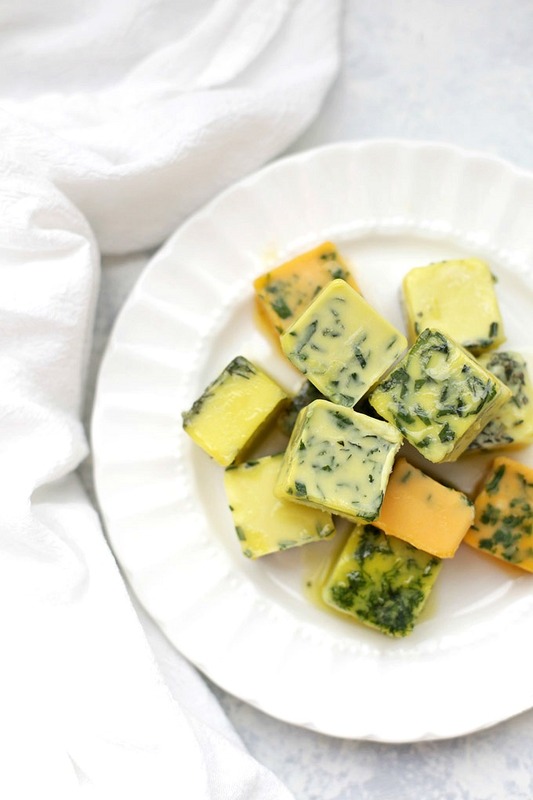 For each herb “bomb,” place fresh herbs in the bottom of an ice cube tray. Pour over the olive oil. Freeze until firm, then transfer to an airtight bag or container until ready to use. and so much more! Make as many as you like! This is a really interesting post. I will try the ice cube tray method. I’m glad to have a recommendation for a good olive oil. We use olive oil constantly. There’s a Sprouts just around the corner, so I’ll pick up this brand and give it a try. Thank you Ellen! If you’re not an Arizona local, you may not be able to find it at your Sprouts, but Queen Creek Olive Mill ships nationwide!